New York is one of those cities you just have to visit at least once - but preferably more of course - in your life. I've never encountered any city with a similar hectic, yet crazy inspiring energy, as well as a huge amount of Instagram-worthy places to visit. 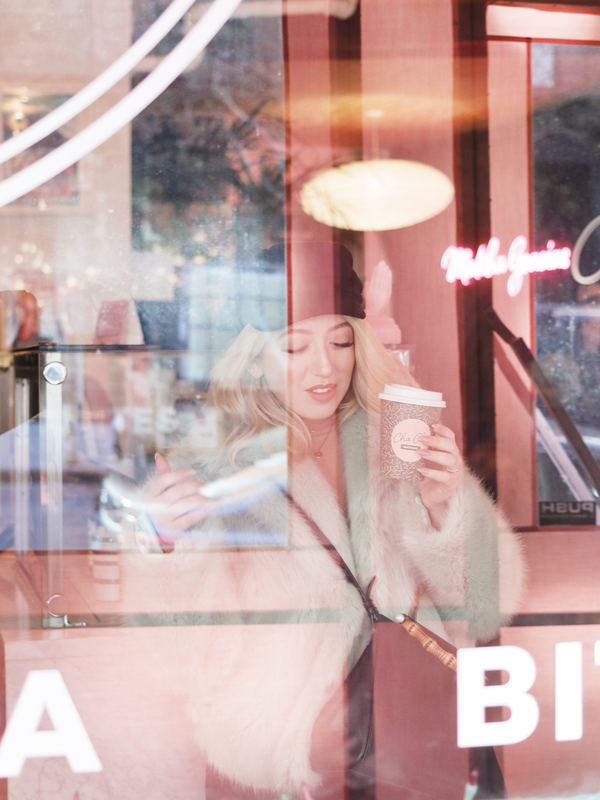 Because there is so much to do and see in the Big Apple, I wanted to create this New York City Instagram Hotspot Guide: The NYC Guide when it comes aesthetically pleasing hotspots to stay and eat, curated for you, by yours truly. 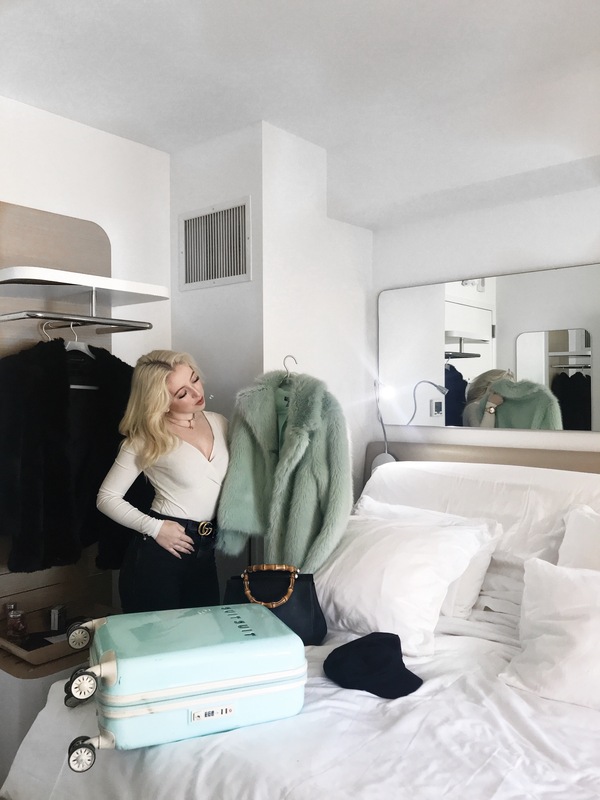 Read this if you're planning a city trip to NYC as well and you need some Instagram proof hotspots to visit! "At YOTEL, what sets us aside from other New York hotels is our clever design, we optimise every inch of space and create contemporary areas for co-working and socialising. We would like to think that our use of technology and space makes things easier and saves you time and money by giving you everything you need and nothing you don’t." Although this city never sleeps, I do want you to get some rest during your stay in NYC. If you're looking for a place to stay and wind down in New York City, Yotel Hotel will be your best bet. 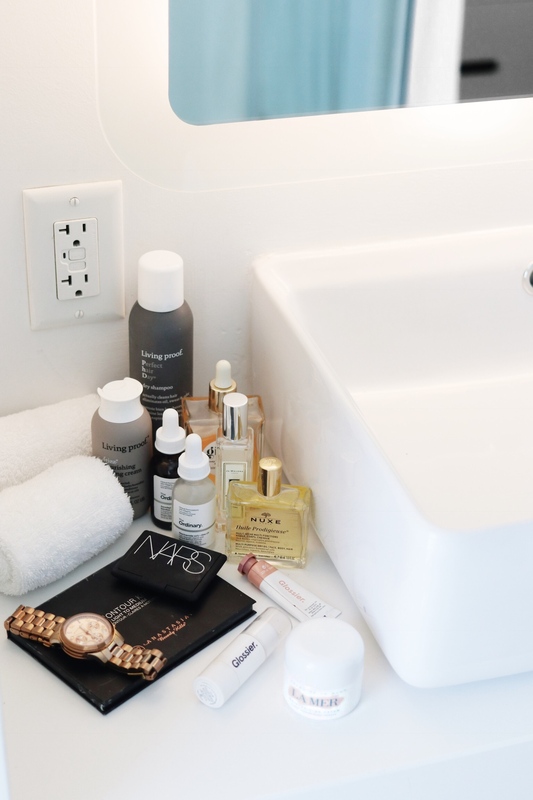 Everything in this hotel is very minimalistic and futuristic, and the rooms itself have a feeling like you're staying in the most luxurious aircraft cabin out there, including the same stunning view over New York City. The rooms are small, but very cosy and chic: Think of a SmartBed that automatically changes from a couch to a bed (and yes, it is very comfortable too, very different from those cheap couch-beds you get at Ikea lol) and a desk and nightstand in one. The hotel has also a beautiful outside terrace and a restaurant you can order room-service from. Yotel is a fairly new hotel, so all the rooms are still very clean and neat. Location wise, Yotel located 10 minutes walking from Times Square. I definitely enjoyed my stay at Yotel and I cannot recommend this lovely and also very affordable hotel more. I am coming back here for sure! You can find more information about Yotel Hotel NYC here. My stay at Yotel Hotel was complimentary. "Pietro NoLita is a unique pink "jewel box in the heart of Nolita. Our cafe serves delicious, healthy, seasonal Italian cuisine." If you love pink and Italian food, you need to visit Pietro NoLita. This tiny restaurant (yes, be prepared to have pretty much no personal space when eating here) is completely pink as f*ck from top to bottom. The food is healthy and vegetarian proof, and I definitely enjoyed my simple, yet tasty pasta. Don't expect the world's best and most complex dishes here, but if you're in a pink mood and want to eat some Italian food, go to this place! Nota bene: The restaurant does not allow you to take pictures with a camera, only with your phone (honestly, I really don't understand why, but oh well). The lighting isn't great there either, so make sure you visit this hotspot during the day to get a decent picture with your phone! You can find more information about Pietro NoLita here. "Inspired by the people, passion and warmth of Uji, Matthew and Conrad returned to Manhattan with a plan to open their own matcha shop that embodied both their New York sensibility and the stateliness of Eastern tea practices. Armed with inspiration and tea leaves straight from Uji, they started developing quirky recipes to showcase the flavor of authentic Japanese Ceremonial Matcha." 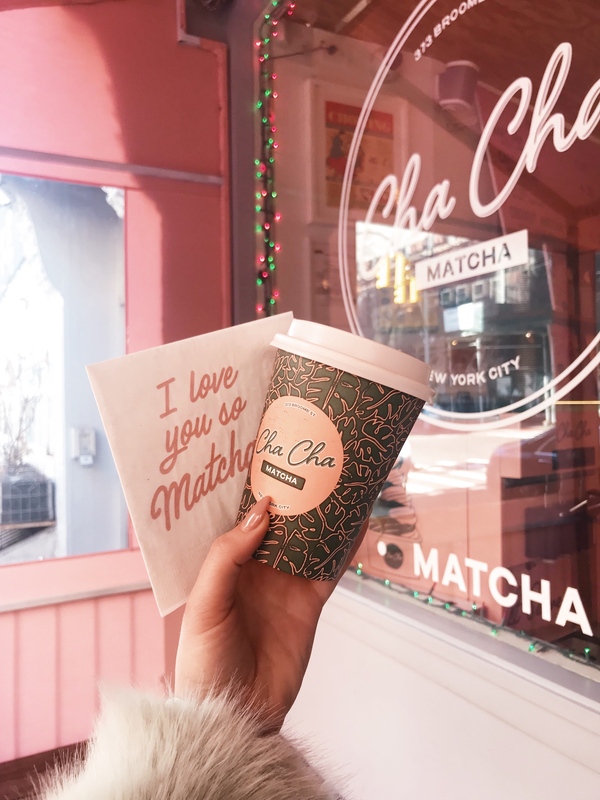 If you love matcha - and even if you don't - Cha Cha Matcha is a hotspot you must visit. The interior is to die for - think of pink and green accents everywhere - and they have a lot of matcha and non-matcha foods and beverages here. 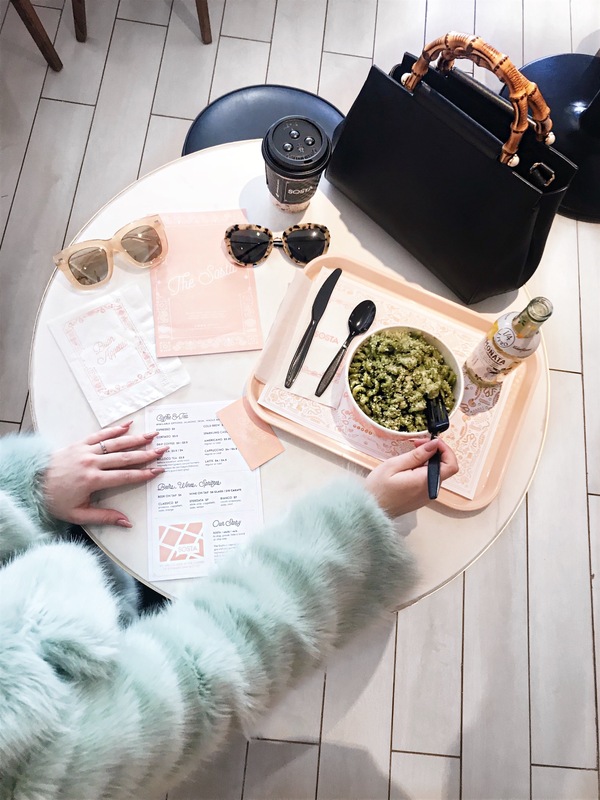 I had a lovely healthy breakfast here with a soy latte and overnight oats (sorry, not the biggest fan of matcha), but if you are a matcha lover, you can literally eat your matcha heart out with for example matcha ice cream or matcha lattes. You can find more information about Cha Cha Matcha here. "The Sosta is a fresh, authentic Italian restaurant inspired by Chef Ali LaRaia’s travels through Italy, with a focus on fresh pasta, made in-house each and every day. Our mission is to bring the simplicity, style and quality of a true Italian experience to New York City." This is probably my favorite restaurant in my New York City Instagram Hotspot Guide. Why? Firstly, Italian food is definitely my favorite food ever, so that one is easy. I'm very picky with my Italian food, but the pasta pesto that I had here was delicious. Secondly, I find the interior of hotspots very important, and this restaurant is really aesthetically pleasing. Think of white, pink and gold accents everywhere. 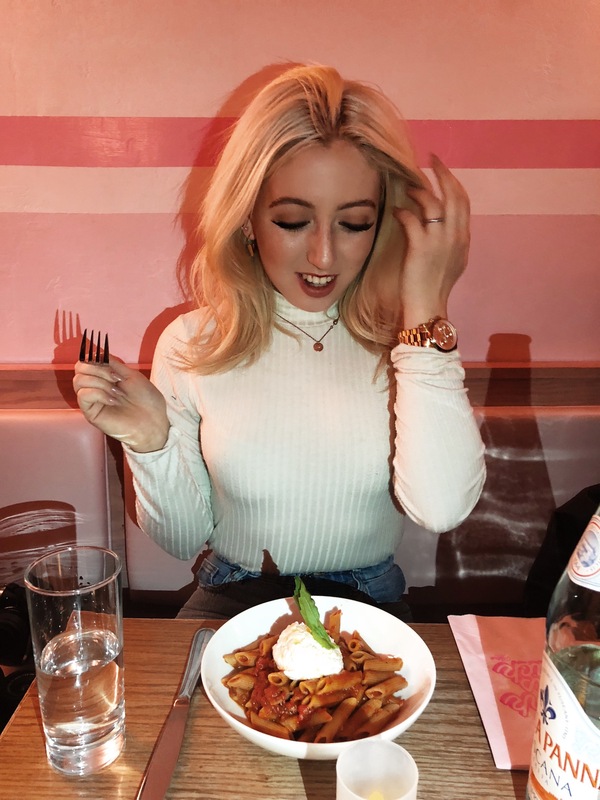 Thirdly, I love hotspots that have a casual atmosphere, in the sense that you can just grab a bite there by yourself or with friends, or plan a pasta study session there. The Sosta is in my opinion a must visit during your stay in New York City - you will not regret it! You can find more information about The Sosta here. 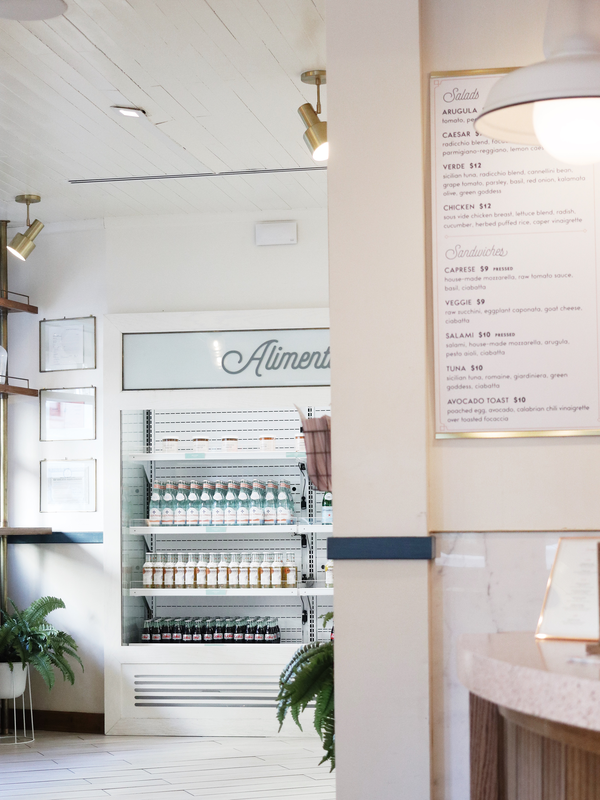 "The Butcher’s Daughter is a plant-based restaurant, cafe, juice bar and “vegetable slaughterhouse." We treat fruits and vegetables as a butcher would meat: We chop, fillet and carve fresh produce into healthy vegetarian dishes and press them into pretty juices." If you're a vegetarian like me, you have to visit The Butcher's Daughter. It can be quite hard sometimes to find restaurants that serve more than one or two vegetarian options, but fortunately enough this hotspot as plenty! Not only do they sell the prettiest juices and smoothies (I mean, how cute does the straw look! ), they also serve great brunch and lunch. I tried the avocado toast here and the eggs, and I both really enjoyed them. The interior is also very cute and has a lot of light, perfect for those hotspot pics! You can find more information about The Butcher's Daughter here. "JOE & THE JUICE, the well-traveled juice bar and coffee concept with a cult following of urban trendsetters and creative thinkers. 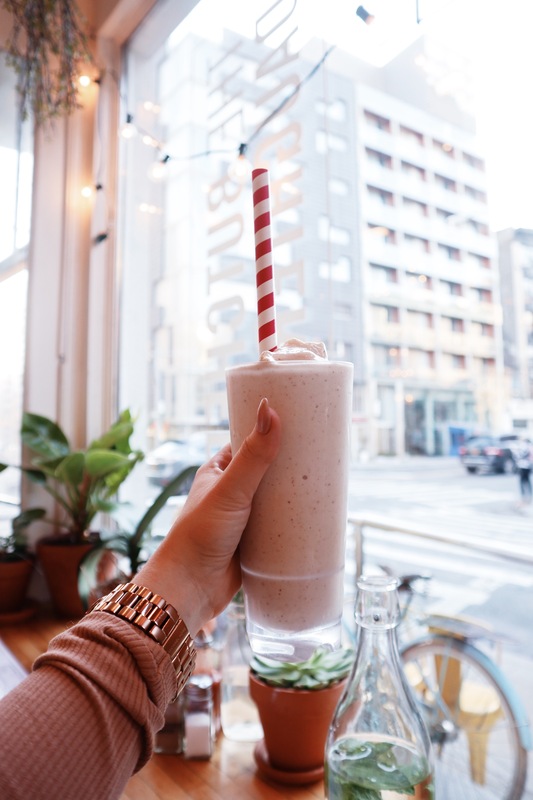 Since its founding more than 15 years ago in Copenhagen by CEO Kasper Basse, JOE & THE JUICE has been casting and creating a dedicated culture of juicers around the globe to serve up high-quality ingredients in freshly prepared juices, shakes, coffees and sandwiches." You can find more information about Joe & The Juice here. I hope you enjoyed my New York City Instagram Hotspot Guide. I realized that almost every hotspot that I chose was pretty much completely pink - I guess I'm obsessed with that color! With that being said, it can be quite hard, finding those places that do not only serve good quality food, but actually look pretty too (and yes, I know many of us Insta gals care about that too!). If you did enjoy this New York City Instagram Hotspot Guide, please leave a comment down below letting me know, because I am also planning on possibly doing an Instagram Hotspot Guide on Washington DC if you guys are interested. 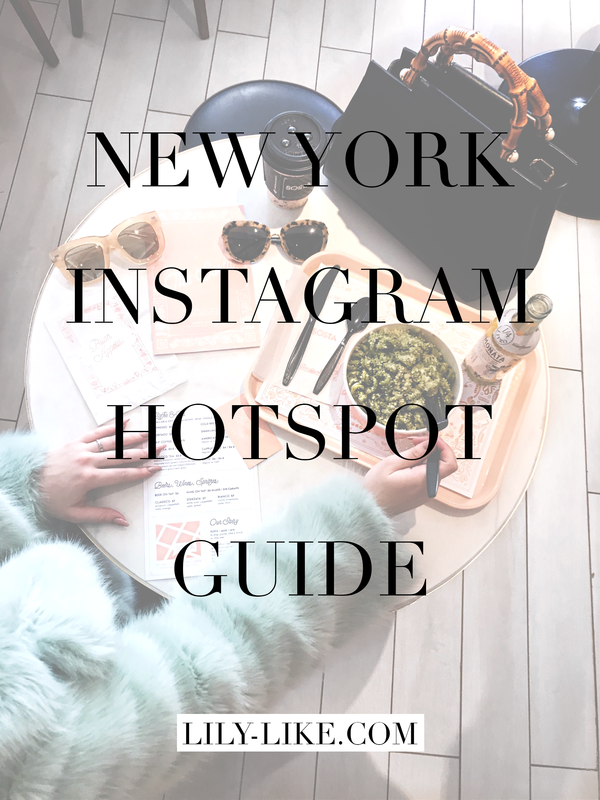 WHAT WAS YOUR FAVORITE HOTSPOT FROM THIS NEW YORK CITY INSTAGRAM HOTSPOT GUIDE? P.S. 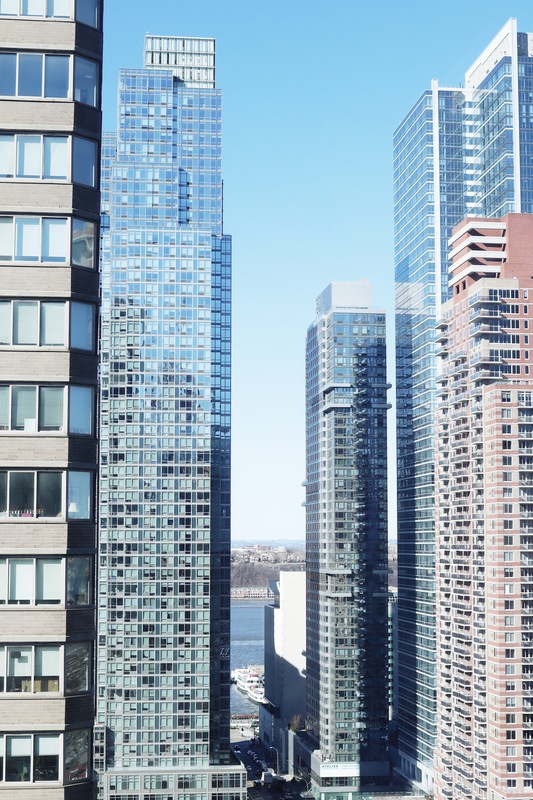 Want to see even more hotspots I've visited in New York? 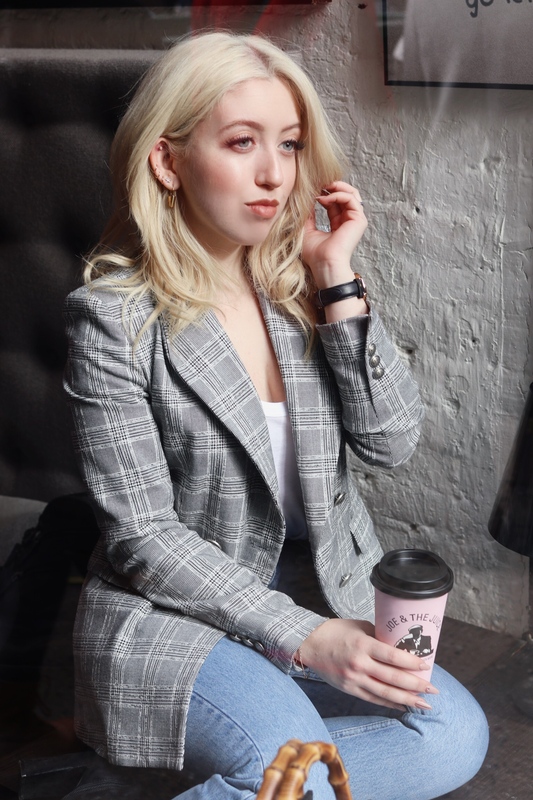 Check out these hotspots from my previous time in the Big Apple! Wauw! Wat een prachtige foto’s en wat ziet het er cool uit. Mooie foto’s. Ik vind je groene fluffy jas, fantastisch! Jessica J. recently posted…6x Opgemaakt in februari 2018! 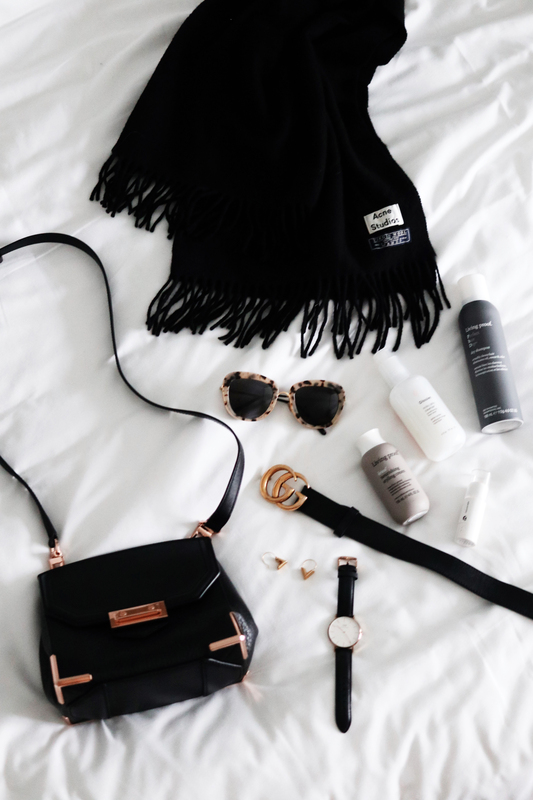 Loved this guide lilia! My favorite was the Sosta, as I am also a fan of italian food (pasta!) so I’d def love to go there when I go back to NYC, and yes please do a DC hotspot time, I’ve been to DC many times but have yet to see all those pretty instagram worthy spots you’re always at! Ooh wat lief dat je al deze hotspots met ons deelt! Ik ben verliefd geworden op New York toen ik er de eerste keer heen ging. Dus ik kan niet wachten om nog eens te gaan en meteen Joe & The Juice te bezoeken. Yara recently posted…Hoe ziet een schooldag eruit voor mij? I was desperate for this! I’m trying to amp up my blogger game and being a 15 minute train ride from NYC is such an amazing opportunity. Thank you so much!